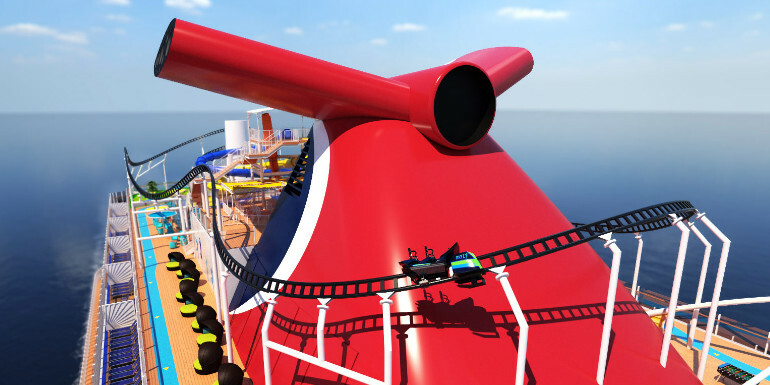 Carnival Cruise Line’s upcoming ship Mardi Gras will feature an industry-first when it debuts in 2020 — a roller coaster on the top deck. Built by Munich-based Maurer Rides, BOLT: Ultimate Sea Coaster will offer almost 800 feet of twists, turns, and drops where riders reach speeds of nearly 40 miles per hour. The coaster will be all-electric and allow two riders in a motorcycle-like vehicle to race along a track 187 feet above sea level. The journey begins with fast acceleration and culminates with a hairpin turn around the ship’s iconic whale tale funnel. Riders’ speeds are posted after the race, since they can customize the trip by choosing their own speed. Just like on land-based roller coasters, a camera installed above the track will take passengers’ photos for a memorable souvenir. Watch a video rendering of BOLT here. Mardi Gras will home port in Port Canaveral, Florida at a brand new terminal built in anticipation of the new ship. Itinerary information will be revealed in January, and more details on the vessel’s features will be announced throughout 2019. The cruise line will begin building a second XL-class ship in 2020, to be delivered in 2022. Just a few years ago, a roller coaster on a cruise ship was the the stuff of April Fools’ jokes, when our own Ship Mate app blog posted a satire news item of a roller coaster on Carnival. Check out the hilarious post from 2017! What do you think of this new attraction? Are you excited to experience it?